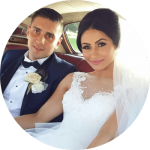 We offer you an elite selection of Bridal Makeup artists known for their exceptional skills, attention to detail, professionalism, and expertise. 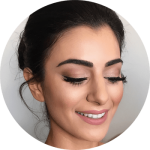 Founder and Creative Director Yvette Elias has established a collective agency of highly skilled make-up artists working within the bridal and fashion industry. Each YVES Makeup artist has been carefully selected by Yvette for their exceptional skills and makeup industry experience. 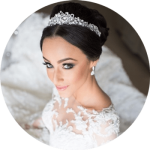 The team have created flawless looks for countless brides and many of Australia’s most talented and respected designers, TV shows, magazines and celebrities. Each artist represents attention to detail and a high standard of work. They have the experience needed to ensure you look exquisite and feel beautiful on your wedding day. We will collaborate with you to deliver a signature look for your wedding day. Our artists are based in Sydney, we also travel throughout Australia and internationally. Yves bridal bookings require a minimum call out fee $1,000. A non refundable $250 deposit per person is required to secure your booking. Inclusions: Minimum 1-2 hour per person makeup session with Yvette Elias and Senior artist. Single set of human hair lashes included in price. To book one of our other Yves Makeup Artists or one of our Emerging Artists in our roster please specify which artist in the booking form along with your details and we will customize a package for you. I can’t thank these talented and beautiful women enough for being such an important part of this special day. I have so much love and appreciation for you all. Copyright © 2018 Yvette Elias. Web Design By The Web Dojo.